I can remember times as a child, when due to snow, either church was cancelled or we just couldn’t get out the driveway. My mom did Sunday School with us right there at home… singing a few songs and telling us a Bible story, so that – while we may have missed church, we didn’t miss Sunday School. That’s important and I’m thankful for Liz who goes a long way to following that example with our kids. I’m thankful for Sunday School teachers but, parents, we have our kids much more than the church, the youth group or the Sunday School teachers. If they’re going to consider it meaningful… they’ve got to see us consider it meaningful. Looking very much forward to being with Bro. & Sis. James Poitras this weekend… special guests for the Sunday School seminar. In order to get to Melun at a reasonable time, we took the boys out of school at noon (still… we didn’t get on the road until 2:30ish… what’s with that? 🙂 ) and hit the road toward Paris. In typical style, Liz had 10 bags at her feet (slight exaggeration… but only slight – multi-tasking as is her specialty)… and the kids were all plugged into music or games. The fields are very green at this time of year, benefiting from the winter precipitation and the relatively cool days that don’t dry out the fields. Very glad to make this road-trip as a family of 5 rather than alone as I often do. So THIS is exciting! Sophie & Dominic will be attending NAYC this summer. As MKs, the Gen. Youth Division is covering their airfare – what a HUGE blessing. Timo is still a bit young and will be doing something special with Liz (details to follow). Since we’re not ready yet to send them across the ocean (or through US Customs) alone, I’ll be accompanying them… Indianapolis… here we come! Very excited to launch the book in less than a week! This week has been spent getting some of the tweaking done on the electronic version (seems there is always one more tweak to do) as well as getting the paperback version ready to go as well (got the manuscript and the cover art uploaded on Thursday). Are you, or is someone you know, planning a trip to Paris? 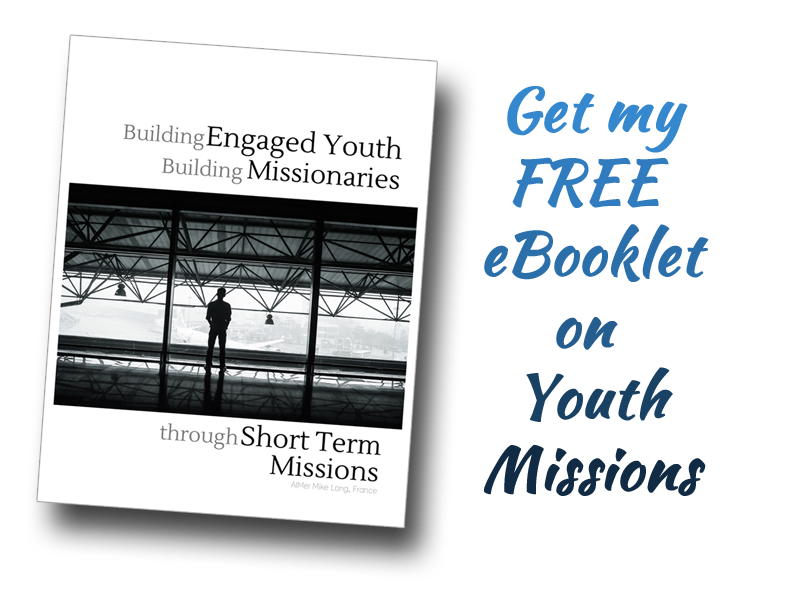 This Monday is going to be another Short Term Missions themed post… sort of an interesting one. I’ll give you 12 reasons why STM can be a source or time of frustration and one reason why those 12 aren’t enough to keep you from being involved. Click here to read that post now. Thank you for checking in again today. I appreciate you spending time with us in this virtual manner. To finish off today, I thought I’d share with you a few photos of Chauvigny, a little 12th century town roughly 30min from us, just down the Vienne River. Every town needs a dungeon! Awesome!!! I pray you guys have an incredible Sunday School Seminar!!!! Thanks Bro Moore! Bro & Sis Jim & Linda Poitras were the bomb!